The annual census of the Independent Schools Council (ISC) finds a marginal drop in the enrolment of non-British pupils whose parents live overseas. The 2017 census indicates a total of 27,281 non-British pupils enrolled this year, based on 1,301 schools reporting. This represents a 1.3% decrease from the 27,633 foreign students reported by 1,280 responding schools in 2016. However, foreign student enrolment, as a proportion of total enrolment, dipped only slightly from 5.3% in 2016 to 5.2% this year. The census also provides a “ringed fence” analysis focused on results for the 1,259 schools that reported in both 2016 and 2017. Total enrolment for this group of respondents dropped by 1.4% year-over-year, from 27,386 students to 27,006. In fact, most leading source markets declined this year, with the notable exception of China and Hong Kong. China remains by far the largest sending market. Nearly one in four students at British independent schools (24.4%, or 6,599 students in 2017) are Chinese. Another 17.5% (4,721 students for 2017) are from Hong Kong. Gains from both of these key markets, which were up 6.5% and 2.9% respectively this year, have helped to blunt some notable drops in other top ten markets. Russia is the number three sender for British independent schools and it fell off by nearly 18% this year. German numbers were down 8%, Spanish enrolment fell 11%, and Nigeria dropped by 13%. Elsewhere in Asia, Japan, South Korea, and Malaysia also all declined, by 15%, 6%, and 13% respectively. As in previous years, the 2017 census finds that enrolment of foreign students tends to be concentrated in the later school years (55% are in years 12 and 13), and that most – 93% in 2017 – are boarders. 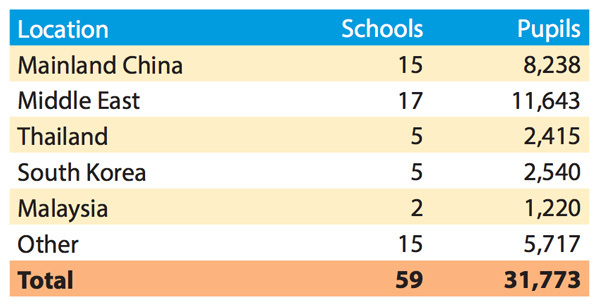 ISC points out as well that 698 of the 1,301 responding schools for 2017 are Tier 4 sponsors, and are therefore eligible to enroll non-European Economic Area students. As we began to note in 2014, the number of offshore campuses operated by British independent schools has grown steadily since 2013. In that year, there were 29 campuses abroad with a combined enrolment of 18,784 students. This year, those totals have grown to 59 offshore campuses (an 103% increase since 2013) with 31,773 students (a 70% increase). From 2016 alone, the number of campuses has expanded by nearly 30% and combined offshore enrolment by 15%. This entry was posted in Europe, K-12, Most Popular, Regions, United Kingdom and tagged international students, student enrolment, British independent schools, independent schools, education abroad.